He has long had a fascination with the precision and complexity of industrial design, particularly nineteenth- and early-twentieth-century studies of machines of war. Renaissance art and figure studies have been influential to his career as an artist and were a major focus of his education. The realistic depiction of the human body, in particular the beauty of the female form in its natural, organic state, captivates Park. The fusion of machine and female images simultaneously reveals beauty and revulsion. All sensuality and vitality grows cold and lifeless when entangled with mechanical parts. 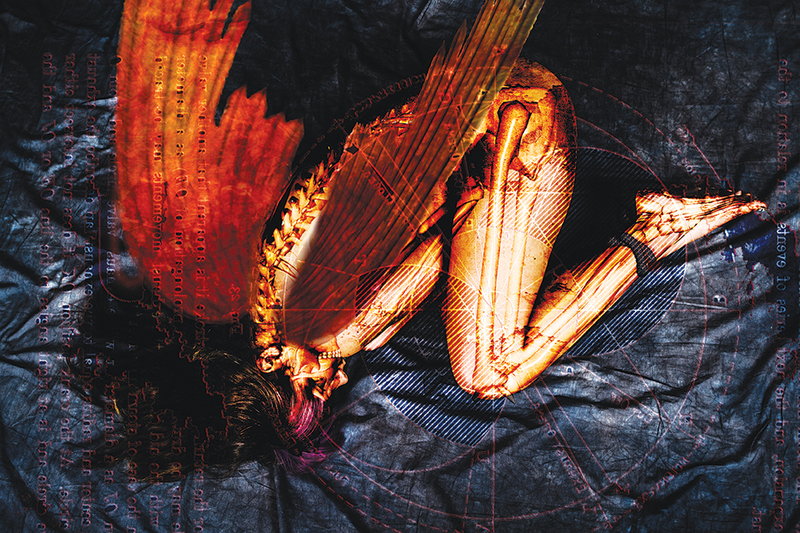 In the first piece in the series, Suffer, the female subject is a winged and damaged creature, curled up into a fetal position. She is left exposed, bones visible through her skin. She is lost in her own ruin and disempowerment. A sense of mental claustrophobia connects this image to its companion image, Fixation. This female figure, also in a submissive fetal position, is prisoner to her own thoughts, seemingly unaware of the messages branded on her body. 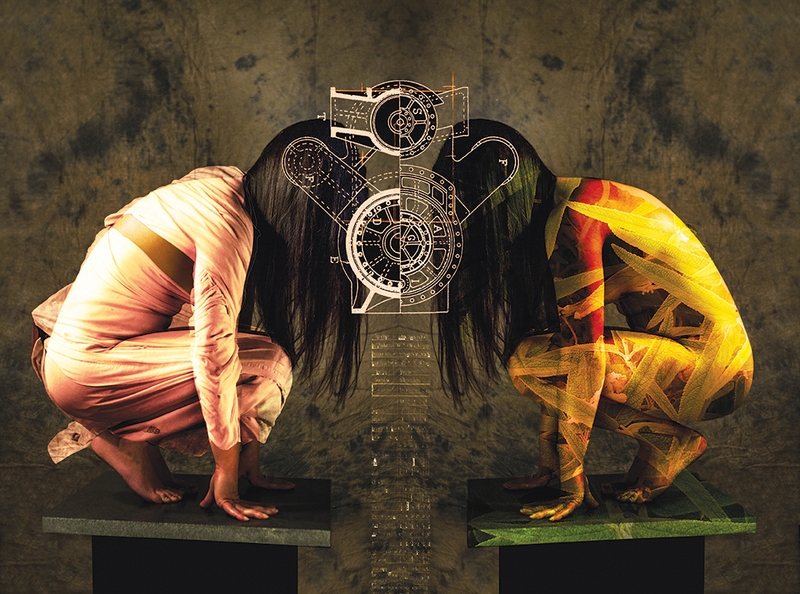 In Jessica Experiment, the human form is barely discernable beneath a somber grey fog. The aerial perspective of this piece looks like a crime scene, and Jessica is both icy and bloodless. Only her eyes remain animated, flickering. Her body seems possessed by the mechanical imagery at work on her face. A human-machine hybrid emerges. Perhaps the most mysterious and bone-chilling piece in the series is Icon. The portrayal of the female figure is haunting, her face framed by a mechanical grid. Park notes that the original photo was taken next to a crypt door, but he manipulated the image to leave the viewer questioning whether she is going in or coming out. This gothic image is also strongly reminiscent of an allegorical tragedy, a doomed heroine in classical drapery who has made a deal with the devil. Johnny Lee Park has a background in figure studies and printmaking, especially lithography and etching. He is a practicing photographer and teaches both photography and graphic design. Park has his MFA in photography and printmaking and has taught at a number of Middle Tennessee universities. 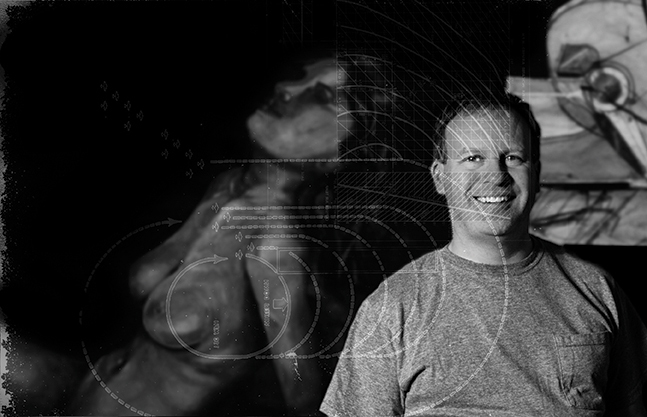 He is currently a full-time instructor at the International Academy of Design and Technology in Nashville. An exhibit of Johnny Lee Park’s work opens January 16 at The Building, 1008 Woodland Street. Contact unboundartsnashville@gmail.com for more information.